Ingredients: Peanuts, Sugar, Milk Solids, Vegetable Fat, Cocoa Powder, Cocoa Butter, Cocoa Mass, Emulsifiers (Soy Lecithin, 476, 492), Glazing Agents (414, 904), Flavour, Salt, Cocoa Solids 5.2%, Milk Solids 10.1%, Peanuts 50.0%. Allergen Warnings: Manufactured on equipment used to process Peanuts, Tree Nuts, Wheat & Barley. May contain traces of Peanuts, Tree Nuts, Wheat, Barley & Eggs. Remember this? 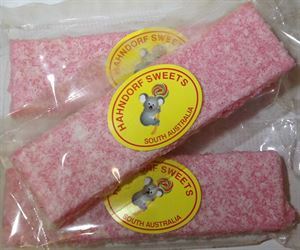 Our Coconut Ice is made locally in South Australia. Delicious sugary, coconut centre with an added sprinkle of coconut to top it off.